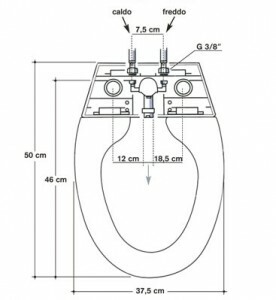 Along with the traditional production of polyester resin toilet seats and covers for any type of sanitary unit SAPAL also manufactures, in accordance with current legislation regarding “architectural barriers”, specific models of toilet seats and covers with front ring opening to ease access for disabled people and to grant a more pratical usage by elderly people. The number of these models of toilet-seats keeps on growing both in the traditional version (cover/open ring) and in the more innovative one (only open ring), in virtue of the growing attention the firms producing sanitary facilities are paying to these problem. Actually SAPAL has up to date this line with the introduction of the TOILET SEAT-BIDET and the HIGH NO-CONTACT on the market, who to take a place of primary importance on the products innovation. TOILET SEAT-BIDET represented a place of primary importance among the new products in this price list. This universal toilet immediately turns into a bidet, in fact the (brass-plated) mixer unit with a simple movement allow supply of hot and cold water. 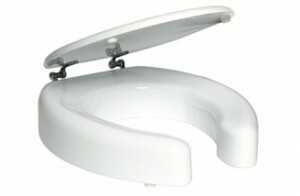 The toilet seat with the two combined function is the best thing when in a bathroom you can put only the lavatory bowl. 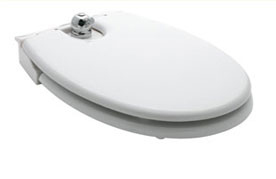 TOILET SEATBIDET is pratical and essential for people with problems moving. This article available in two models: with a mixer or two side taps. © Copyright 2015 Tutti i diritti riservati.